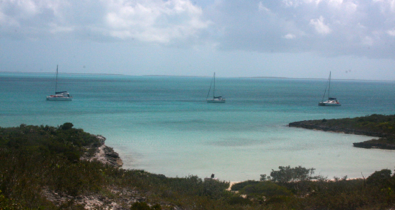 We left Georgetown at 0710 and traveled north on the Exuma Sound, arriving at the above anchorage called Williams Bay on Lee Stocking Island at 1120. We motorsailed with just one 40 hp engine running to save fuel. We had anchored here with Big Run a few months ago and love the quiet setting. I took my kayak and paddled along the shore line. 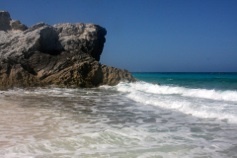 So peaceful to be alone with no sounds, just the wind and waves. 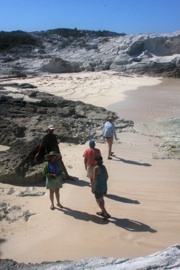 Later the six of us walked over to the Exuma Sound side. The shore on the Sound side was mostly rocky and the waves were crashing on the shore. It had gotten rougher since we came into the Bank side of the cay. Afterwards we returned to our boats and jumped in the water. Even though all the water in the Bahamas looks clean, in a huge anchorage like Georgetown where dinghies and boats are moving and everyone does not use the pumpout boat we do not swim. After a swim, we cleaned up and went to Interlude for sundowners and a spaghetti dinner. it was fun talking with Fred and Kathy who are on a 42 ft Leopard catamaran (Makai) and have traveled extensively in the Caribbean and South America. Tomorrow we will go back out on the Sound (deep water) and sail to Blackpoint. 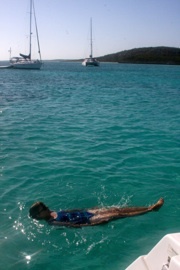 We’ll spend the night there and then head on to Staniel Cay which will just take an hour and a half. The weather is getting hotter and more humid as the days are longer. The water is warm also. Luckily there is usually a nice breeze, but when there isn’t we wish we could turn on the air conditioner. In the morning, the entire deck is thick with dew. We have no plans after Staniel Cay except to continue moving north. We are stopping at any places with good snorkeling and/or hiking.